Ice sheets respond slowly to changes in climate, because they are so massive that they themselves dominate the climate conditions over and around them. But once they start flowing faster towards the shore and melting into the ocean the process takes centuries to reverse. Ice sheets are nature’s freight trains: tough to start moving, even harder to stop. We know this process has been going back and forth throughout history – it’s why we’ve had ice ages and warm periods. But until now we haven’t known exactly how quickly ice sheets retreated and reformed. New research published in the journal Nature Communications gives us an answer, and it isn’t great news. It turns out sea levels often rose at scary rates in response to natural climate changes, long before mankind began pumping carbon into the atmosphere. In the short-term sea level is affected by ocean warming and so-called “thermal expansion”, or melting glaciers based on land. 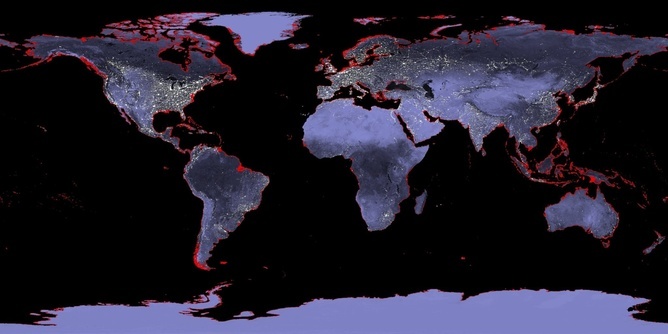 These changes can occur quickly – within a decade – but their impact on sea level is relatively small, in the tens of centimeters. The drivers of longer-term sea level rise, over decades or centuries, are the continental ice sheets of Greenland and Antarctica. On the fringes of these ice sheets are “ice shelves” stretching far out into the ocean. Ice shelves can be hundreds of meters thick and, because 90% of ice in water floats below the surface, they remain “grounded” on the sea floor as long as the sea is less deep than 90% of the ice shelf thickness. Where the sea floor is deeper or the ice shelf gets thinner, there will be an area of floating land ice; here, warming ocean water can get underneath and melt the ice. Once sufficiently destabilized, an ice shelf can break up catastrophically. Such an ice shelf collapse takes the brakes off the ice stream that feeds into the ice shelf, and land ice starts to flow much quicker towards the ocean. Ice flow is a relatively slow process, and it takes some forcing to get a major ice sheet to systematically respond (like trying to set a fully loaded freight train into motion). Once moving, however, it will be equally hard to arrest that movement (like trying to stop a moving, fully loaded freight train). Still, we cannot ignore it, because the sheer volume of land ice on Earth is enormous – equivalent to more than 65 meter of global sea level rise; Greenland alone accounts for 6 to 7 meters, West Antarctica for some 5-6m, and East Antarctica for the remainder. These melting ice sheets will dominate major sea level changes for centuries to come. We can learn something about what to expect by examining sea level changes during the past five ice-age cycles (past half million years), especially through comparing them with the total amount of ice on the planet at the time. During a peak ice age, Earth held almost three times as much land ice as it holds today. For instance, during the most recent ice age the ice sheet over North America was 10-20% larger than the one we see today over all of Antarctica. During warm periods in between ice ages the sea was often close to its present level but occasionally reached up to 8 or 9m above today’s shoreline – the equivalent of melting 1.3 Greenlands today. To get a sense of how quickly the sea went up and down, we need highly detailed and well-dated records. Over the past decade I’ve led a team of scientists at the University of Southampton and the Australian National University who have developed such records using data from the Red Sea. The Red Sea has a very shallow and narrow connection with the open Indian Ocean. It also evaporates quickly – the equivalent of 2m of water each year – so new water must constantly flow in to top up sea levels and to avoid it getting too salty. But such inflow is restricted by the tiny gap between Djibouti and Yemen, and in the past that connection was even smaller. As a result, the Red Sea was much saltier during previous ice ages, when sea level stood more than 100m below the present. Using microfossils from drill cores from the sea floor we can measure salinity through time and translate this to sea level changes in the Red Sea connection with the Indian Ocean. We were able to assess timings more accurately by comparing these sea level records to climate records from caves, which can be precisely dated by looking at radioactive decay in uranium. So now we had a detailed sea level record, with a well-defined timescale. Finally, we could work out rates of past sea level changes, and compare changing sea levels with well-dated reconstructions of temperature and CO2 changes (from ice cores). This allowed us to assess the speed of some 120 sea level rises in the past. Previously, this was possible only for one recent event. Now, for the first time, we had the information to look at how sea levels responded to natural climate change. It appears the sea level could rise as quickly as 5.5m per century. However this only happened at the abrupt endings of ice ages, starting with about three times the modern ice volume. When starting with double the modern ice volume or less, sea levels did not rise faster than 2m per century. When global ice volume was similar to the present, the sea typically rose less than 1 to 1.5m per century. So it seems the fastest losses of ice occur when there is more ice. Not much of a surprise, perhaps, but now at least we have some real numbers to say how fast, and how much ice. And the speed the sea can rise during periods with modern ice volumes is still worrying – a 1 meter rise this century would hugely affect millions of people. Given that Earth has achieved these rates even when warming was much slower than today, such a rise is very possible. In the 120 different events we looked at, ice sheets went from initial change to maximum retreat within 400 years 68% of the time, and within 1100 years for 95%. In other words: once triggered, ice sheet reduction (and therefore sea level rise) kept accelerating relentlessly for many centuries. Research we carried out previously found that modern sea level rise seems to be conforming to what we would expect from (high end) natural responses to warming. That is: after 150 years of increasing (man made) warming, the ice sheets would only recently be reaching the point where they start making a noticeable contribution to sea level rise. But that time has come and, once ice sheets start to melt, the freight train is in motion. It will then keep moving for many centuries to come, no matter how hard we stamp on the brakes. Eelco Rohling, Professor of Ocean and Climate Change at University of Southampton, receives funding from the UK Natural Environment Research Council, and from the Australian Research Council. This article was originally published on The Conversation.Read the original article.